Home News Woods Honoured To Have Genesis Open Now In Same League As Arnie’s & Jack’s Events. Woods Honoured To Have Genesis Open Now In Same League As Arnie’s & Jack’s Events. 2 months ago by Fatiha Betscher Comments Off on Woods Honoured To Have Genesis Open Now In Same League As Arnie’s & Jack’s Events. 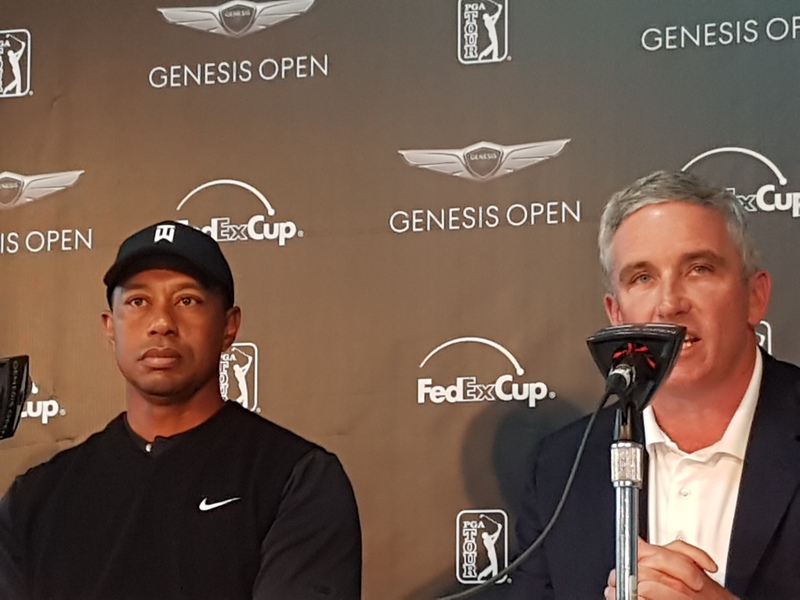 Tiger Woods said he was honoured that changes from next year to the TGR hosted Genesis Open will see it now ranked up there with the Arnold Palmer Invitational and the Jack Nicklaus hosted Memorial. PGA Tour Commissioner, Jay Monahan was on hand to officially announced the new stature of this week’s event. In collaboration with the tournament’s broadcast partners, recognition of Woods’ vast accomplishments as a player and his philanthropic work through the TGR Foundation will be amplified through the telecasts and promotion of the tournament. Woods was then asked his reaction to the news. “The event is being reduced to 120, so trying to get into the event is going to be a little more difficult and you’re going to have more players — well, more of the top players playing because of world ranking points,” said Woods. “That three-year exemption is a big deal. That extra year, it makes for an opportunity for someone to have a little bit longer future and to go alongside with Jack and Arnold. I’ve been lucky enough to have won those two events. For me, it’s been so special to be able to walk off those greens and to see those two gentlemen there, and to be able to have this event in that same breath as the two guys that I looked up to my entire playing career, it’s just very special. “So, we’re all honoured to be included in this category and to be able to have an opportunity with Genesis to be able to do something like this. “And to do it here where I grew up and to do it here where my entire career got started, couldn’t ask for more of a symbiotic outcome. We’re just so excited about this opportunity to showcase what we’ve done as a foundation for over 20 years and this elevation status will certainly help that. It is going to help so many more kids’ lives, and we’re able to do that with a tournament like this.